Why Would You Overclock Your Computer? Should You Ever Overclock Your Computer? Many people probably don't know what overclocking is but have possibly heard the term used before. To put it in its simplest terms, overclocking is taking a computer component such as a processor and running at a specification higher than rated by the manufacturer. Every part produced by companies such as Intel and AMD are rated for specific speeds. They have tested the capabilities of the part and certified it for that given speed. Of course, most parts are underrated for increased reliability. Overclocking a part simply takes advantage of the remaining potential out of a computer part that the manufacturer is unwilling to certify the part for but it is capable of. The primary benefit of overclocking is additional computer performance without the increased cost. Most individuals who overclock their system either want to try and produce the fastest desktop system possible or to extend their computer power on a limited budget. In some cases, individuals are able to boost their system performance 25% or more! For example, a person may buy something like an AMD 2500+ and through careful overclocking end up with a processor that runs at the equivalent processing power as an AMD 3000+, but at a greatly reduced cost. There are drawbacks to overclocking a computer system. The biggest drawback to overclocking a computer part is that you are voiding any warranty provided by the manufacturer because it is not running within its rated specification. 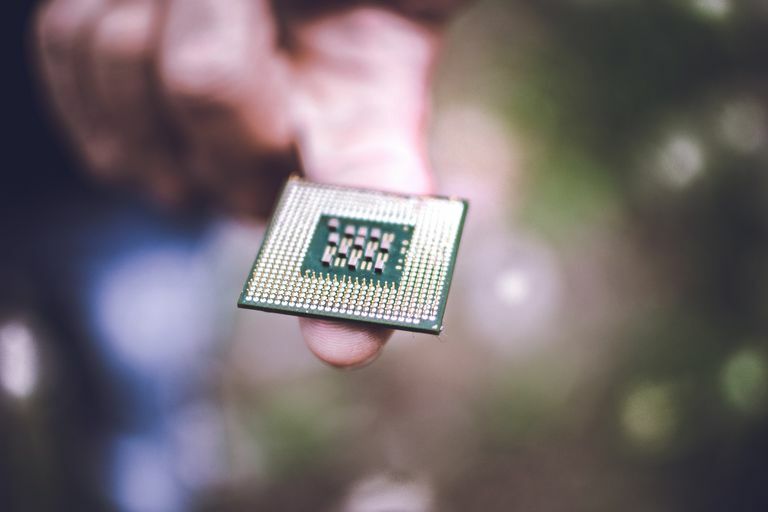 Overclocked parts that are pushed to their limits also tend to have a reduced functional lifespan or even worse, if improperly done, can be destroyed completely. For that reason, all overclocking guides on the internet will have a disclaimer warning individuals of these facts before telling you the steps to overclocking. To first understand overclocking a CPU in a computer, it is important to know how the speed of the processor is computed. All processor speeds are based on two distinct factors, bus speed, and multiplier. The bus speed is the core clock cycle rate that the processor communicates with items such as the memory and the chipset. It is commonly rated in the MHz rating scale referring to the number of cycles per second that it runs at. The problem is the bus term is used frequently for different aspects of the computer and will likely be lower than the user expects. For example, an AMD XP 3200+ processor uses a 400 MHz DDR memory, but the processor is, in fact, using a 200MHz frontside bus that is clock doubled to use 400 MHz DDR memory. Similarly, Pentium 4 C processors have an 800 MHz frontside bus, but it is really a quad pumped 200 MHz bus. When overclocking a processor, these are the two factors that can be used to influence the performance. Increasing the bus speed will have the greatest impact as it increases factors such as memory speed (if the memory runs synchronously) as well as the processor speed. The multiplier has a lower impact than the bus speed, but can be more difficult to adjust. In the above example, we have done two changes each with a result that places it at either the speed of the 3200+ or a 3000+ processor. Of course, these speeds are not necessarily possible on every Athlon XP 2500+. In addition, there may be a large number of other factors to take into consideration to reach such speeds. Because overclocking was becoming a problem from some unscrupulous dealers who were overclocking lower rated processors and selling them as higher priced processors, the manufacturers started to implement hardware locks to make overclocking more difficult. The most common method is through clock locking. The manufacturers modify traces on the chips to run only at a specific multiplier. This can still be defeated through modification of the processor, but it is much more difficult. Every computer part is regulated to specific voltages for their operation. During the process of overclocking the parts, it's possible that the electrical signal will be degraded as it traverses the circuitry. If the degradation is enough, it can cause the system to become unstable. When overclocking the bus or multiplier speeds, the signals are more likely to get interference. To combat this, one can increase the voltages to the CPU core, memory or AGP bus. There are limits to the amount of additional voltage that can be applied to the processor. If too much voltage is applied, the circuits inside the parts can be destroyed. Typically this is not a problem because most motherboards restrict the possible voltage settings. The more common problem is overheating. The more voltage supplied, the higher the thermal output of the processor. The biggest obstacle to overclocking the computer system is heat. Today's high-speed computer systems already produce a large amount of heat. Overclocking a computer system just compounds these problems. As a result, anyone planning to overclock their computer system should be very aware of the needs for high-performance cooling solutions. The most common form of cooling a computer system is through standard air cooling. This comes in the form of CPU heatsinks and fans, heat spreaders on memory, fans on video cards and case fans. Proper airflow and good conducting metals are key to the performance of air cooling. Large copper heatsinks tend to perform better and the greater number of case fans to pull in air into the system also helps to improve cooling. Beyond air cooling, there is liquid cooling and phase change cooling. These systems are far more complex and expensive than standard PC cooling solutions, but they offer a higher performance at heat dissipation and generally lower noise. Well-built systems can allow the overclocker to really push the performance of their hardware to its limits, but the cost can end up being more expensive than processor to begin with. The other drawback is liquids running through the system that can risk electrical shorts damaging or destroying the equipment. Throughout this article, we have discussed what it means to overclock a system, but there are a lot of factors that will affect whether a computer system can even be overclocked. The first and foremost is a motherboard and chipset that has a BIOS that allows the user to modify the settings. Without this capability, it is not possible to modify the bus speeds or multipliers to push the performance. Most commercially available computer systems from the major manufacturers do not have this capability. This is why most people interested in overclocking tend to buy specific parts and build their own systems or from integrators who sell the parts that make it possible to overclock. Beyond the motherboards ability to adjust the actual settings for the CPU, other components must also be able to handle the increased speeds. Cooling has already been mentioned, but if one plans on overclocking the bus speed and keeping the memory synchronous to offer the best memory performance, it is important to buy memory that is rating or tested for higher speeds. For example, overclocking an Athlon XP 2500+ frontside bus from 166 MHz to 200 MHz requires that the system have memory that is PC3200 or DDR400 rated. This is why companies such as Corsair and OCZ are very popular with overclockers. The frontside bus speed also regulates the other interfaces in the computer system. The chipset uses a ratio to reduce the frontside bus speed to run at the speeds of the interfaces. The three major desktop interfaces are AGP (66 MHz), PCI (33 MHz) and ISA (16 MHz). When the frontside bus is adjusted, these buses will also be running out of specification unless the chipset BIOS allows for the ratio to be adjusted down. So it is important to know how adjusting the bus speed can impact stability through the other components. Of course, increasing these bus systems can also improve the performance of them, but only if the components can handle the speeds. Most expansion cards are very limited in their tolerances though. Now those who are looking to actually do some overclocking should be warned not to push things too far right away. Overclocking is a very tricky process of trial and error. Sure a CPU may be able to be greatly overclocked on the first try, but it is generally better to start out slow and gradually work the speeds up. It is best to test the system fully in a taxing application for an extended period of time to ensure the system is stable at that speed. This process is repeated until the system does not test fully stable. At that point, step things back a bit to give some headroom to allow for a stable system that has less chance of damage to the components. Overclocking is a method for increasing the performance of standard computer components to their potential speeds beyond the rated specifications of the manufacturer. The performance gains that can be obtained through overclocking are substantial, but a lot of consideration must be done before taking the steps to overclocking a system. It is important to know the risks involved, the steps that must be done to obtain the results and a clear understanding that results will vary greatly. Those who are willing to take the risks can get some great performance from systems and components that can end up being far less expensive than a top of the line system. For those who want to do overclocking, it is highly recommended to do searches on the internet for information. Researching your components and the steps involved are very important to being successful. How Can Memory Speed and Latency Affect Your PC? What Types of RAM Runs in Today's Computers?